The Caesar’s Empire slot machine is one of the oldest online slot machines, but it is still one of our absolute favorites! It seems like no matter how often we play this slot machine, it never gets old, which is precisely why we proudly recommend this game to all of our website visitors! Caesar’s Empire features 5-reels and 20-lines of gaming action, which will give you plenty of opportunities to produce some big wins! The most entertaining (and slightly addicting) feature of the Caesar’s Empire slot machine is the bonus round. The bonus round is triggered whenever a Caesar symbol appears anywhere and a Colosseum symbol appears on the last reel. Once triggered, you’ll be awarded ten initial free spins, and whenever a Caesar symbol appears during the bonus round, you’ll be awarded additional free spins! This is the kind of bonus that can go on forever, which is exactly what you want in an online slot machine! The Caesar's Empire Slot Machine is just one of hundreds of online slot machines available at Silver Oak Casino. It is a 20-line real series slot machine with an addictive bonus round and a special jackpot that can be won randomly at the completion of any real money spin. We recommend playing this game at Silver Oak Casino because they are currently giving away a $1,000 in free casino mney bonus to all new players that can be used to play the Caesar's Empire Slot Machine! Grab your bonus today and try out this great game for yourself at this reputable online casino! Click here to play Caesar's Empire at Silver Oak Casino! Another great place to play the Caesar's Empire Slot Machine is the popular RTG powered Slots Plus Casino. This respected online casino has been in business for several years and they are known for having some of the hottest online slot machines in the casino industry; including the wildly popular Caesar's Empire Slot Machine! At the moment, all new players at Slots Plus Casino can claim a massive 400% bonus worth up to $3,000 in free casino money when you make your first deposit! This is one of the best bonuses out there and it can be used on the Caesar's Empire Slot Machine, so take advantage of it today before it's too late! Click here to play Caesar's Empire at Slots Plus Casino! Last but not least, one of our favorite places to play online slot machines (including the Caesar's Empire Slot Machine) is Vegas Casino Online. We've got plenty of reasons why this is one of our favorite online casinos, but we'll just tell you a few of the important ones so we don't take up too much of your time! For starters, Vegas Casino Online offers one of the biggest casino bonuses available online (up to $5,000 in free casino money when you make your first purchase). Besides that, they offer hundreds of real money casino games and some of the fastest player payouts in the gaming industry! So don't just take our word for it, visit Vegas Casino Online today to learn for yourself just why this is one of the best online casinos around! Click here to play Caesar's Empire at Vegas Casino Online! Manhattan Slots Casino is a respected RTG powered online casino that accepts players from around the world; including all USA players! At the moment, they are offering the visitors of our website an exclusive $25 free casino money bonus with no deposit required to try out all of their online casino games! Simply redeem the bonus code 25CBG and your account will instantly be credited with your free bonus! Click here to play Caesar's Empire at Manhattan Slots Casino! Aladdin's Gold Casino is a prestigious online casino that runs on RTG software. They have hundreds of real money casino games to choose from; including slots, video poker, table games, and more! Signup with them today and you can get $25 in free bonus money to try out all of their great games with no purchase necessary! Simply redeem our bonus code 25CBG and your account will instantly be credited! Click here to play Caesar's Empire at Aladdin's Gold Casino! Aladdin's Gold Casino is currently offering the visitors of our website two exclusive casino bonuses that you won’t find anywhere else! For starters, you can get $25 in free casino money with no deposit required by redeeming the bonus code 25CBG! Then, when you make your first purchase, you’ll be eligible to receive up to $8,000 in additional bonus money at Aladdin's Gold Casino! Planet7 Casino is an exciting new RTG casino that has hundred of great games to choose from; including slots, craps, roulette, blackjack, video poker, and more! Right now, when you signup and create a free account, you can get $25 in free casino money with no deposit required! Simply redeem the bonus code 25CBG and your account will instantly be credited with this free bonus at Planet7 Casino! Click here to play Caesar's Empire at Planet7 Casino! 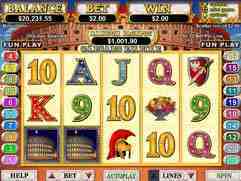 We’ve been playing at iNetBet Casino for years and we proudly recommend them to all of our website visitors. They have been around for more than a decade and they have paid out millions to players from around the world, which makes them one of the oldest and most trusted online casinos. At the moment, you can try them for free by claiming our special bonus code CBG10, which will award you with $10 in free casino money (no deposit needed)! Click here to play Caesar's Empire at iNetBet Casino! Slots Plus Casino is currently home to one of the largest online casino bonuses in the gambling industry. At the moment, when you signup and make your first deposit, you can get a massive 400% bonus worth up to $4,000 in free casino money. That means if you deposit $100, you’ll get $400 free, giving you a starting balance of $500 at Slots Plus Casino! Aladdin’s Gold Casino is an RTG powered online casino that is currently running a fantastic new player promotion that you’ll definitely want to take advantage of! At the moment, when you signup at Aladdin’s Gold Casino, you’ll be eligible to receive an unlimited number of bonuses for your first seven days as a new player! That’s right; you can get a free bonus on each and every deposit you make for your first seven days! Vegas Casino Online is an RTG powered online casino that offers real money Las Vegas style casino games that you can play from the comfort of your own home. They have tons of great games to choose from; including slots, video poker, table games, and more! The great thing about this online casino is that they accept players from around the world; including players from the United States! Signup today and you can get up to $500 in free casino money from Vegas Casino Online! Las Vegas USA Casino is a Real Time Gaming powered online casino that is open to players from around the world; including all USA players! At the moment, all new players who make their first deposit at this established and respected online casino can get up to $500 in free bonus money! This is a great way to boost your bankroll and extend your playing time, which will ultimately increase your chances of winning at Las Vegas USA Casino! Click here to play Caesar's Empire at Las Vegas USA Casino!